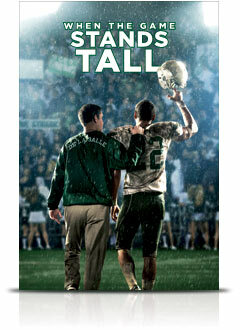 If you are looking for a good movie this weekend, check out When the Game Stands Tall. You don’t have to be a Football groupie to appreciate this (very) inspirational flick. Sure, there are some great game scenes, but this is not a ‘feel good football movie,’ it definitely goes much deeper. Based on the true story of Coach Bob Ladouceur & the De La Salle High School football team in northern California, the film begins with the Spartans 151 game ‘Streak’ – winning 12 straight State Championships in the 1990s and early 2000s. But this movie is not about “the Streak.” (It’s broken.) It’s not just about Football. (“Life” happens.) It’s not just about “the Comeback.” (There are Other Priorities.) It IS about playing with heart, playing as a team, good coaching. It is also about … Adversity. Tragedy. Triumph. Failure. Family. Faith. PERSEVERANCE. Transformation. Cultivating hope amidst dashed dreams… and what it really means to be a TEAM, not just record-breakers but TEAM PLAYERS. There are so many layers to this movie. It’s also about family, albeit a few dysfunctional ones – there’s a father pressuring his son to ACHIEVE, there’s the Coach Ladouceur’s wife who asks at one point, “do I really know you?” Then there’s the ‘family’ of 60 ‘brothers’ on the team. Central to the film is (as stated) not winning, but the journey of transformation – of facing challenges (300 lb average line of a tough opposing team? ), facing fears… & facing themselves… of what it takes to change attitudes. There are many take-a-ways for whatever we may be facing in the fields of our lives. The movie, directed by Thomas Carter (“Coach Carter”), is based on Neil Hayes’ book, “When the Game Stands Tall: The Story of the De La Salle Spartans and Football’s Longest Winning Streak.” After seeing the movie, now i want to read this book!! p.s. my brother-in-law Woody compared this movie to the classic, Rudy. He said, When the Game Stands Tall is one of the best Football Movies – EVER. My sister, Shere, (who is not a big football fan) saw this movie TWICE. It’s that good. Check it out! This entry was posted in MOVIES !! and tagged Christian Brothers de La Salle, Coach Bob Ladouceur, Coach Ladouceur, De La Salle, De La Salle High School, faith films, film reviews, Football, High School Football, independent films, inspirational movies, Jim Caviezel, spiritual transformation, When the Game Stands Tall. Bookmark the permalink. Great movie review Sis! Glad I saw it first with YOU! Nice write-up, GL. Look forward to seeing the movie with your sis’! Thx.